(Newser) – Think Pluto is far from us? 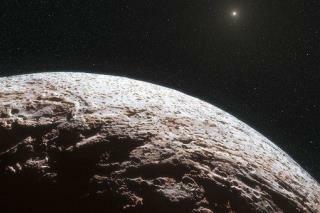 It's a hop, skip, and a jump away compared to what may be the most distant object in our solar system, which is "three times farther than Pluto is from the sun," astronomer Scott Sheppard explains. Sheppard and his colleagues used the Hawaii-based Subaru telescope to search for (and take photos of) far-off objects circling the sun, and the dwarf planet V774104 was identified in mid-October, reports NPR. A computer program created to highlight photos that possibly contained a moving object pointed Sheppard to a traveling speck of light. "When this popped up on the screen, my eyes opened up," he says. V774104 appears to be 9.6 billion miles from the sun, reports the BBC, outpacing the previous record-holder for distance, a dwarf planet called Eris, which at its most distant is 9 billion miles from the sun. I think we should all go there and leave Earth to ISIS along with all Nuclear Weapons that will be armed to detonate once we are safely on our way. "Imagine". Now what? Scientist say stuff. Now what? Correction: this is the farthest object they've FOUND. There may be others farther, but we just haven't found them yet!